Cam's Cinematic Episodes: Greetings From The Trenches! Hey guys, sorry for the inactivity of the blog (Excluding that nifty re-edit I did on my Casino Royale review! Read it again and see!). It's beginning to look like one of those blogs run by lazy people who only update once a month (http://lookakazoo.blogspot.com). I'm currently buried in term papers, with one Archaeology paper in the can, and two more to go in Biological Anthropology and English Fiction. Bah! At any rate, I promise to do a full update with the necessary gibberish on Wednesday. And you can quote me on that... Actually, don't! Just in case... I have a very busy social life... STOP LAUGHING! At any rate, I'm holding to that day as the deadline for my next post, so be here, my fabulous followers, when I re-emerge to pick apart news items of little value. Oh, a time we will have indeed! Anyways, hold tight my brave warriors! In the meantime, have yourself a chuckle or two at that hysterically politically-incorrect comic strip from the 50's. 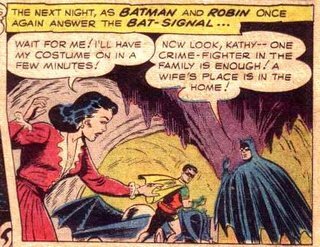 Oh, Batman, you arrogant son-of-a-gun!!! Peter Jackson: Still On THE HOBBIT's Shortlist?? ?